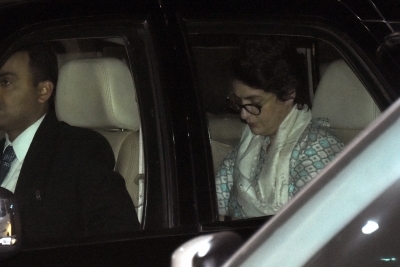 Jaipur/Lucknow, Feb 12 (IANS) Congress General Secretary Priyanka Gandhi Vadra landed in Jaipur on Monday night to accompany her husband Robert Vadra to the Enforcement Directorate (ED) office on Tuesday after he was summoned for interrogation in connection with an alleged land scam in the state's Bikaner. Brother-in-law of Congress President Rahul Gandhi, Robert Vadra was already in Jaipur when Priyanka Gandhi, who had carried out a road show in Lucknow with her brother and other leaders in her first visit to the state after being appointed party incharge for East UP, reached there. He had reached the Rajasthan capital in the afternoon along with his mother Maureen Vadra. Priyanka Gandhi was to address the party workers at the Congress's Mall Avenue office after Rahul Gandhi but she chose not to. An interaction with the media was also aborted last minute. She was slated to spend the night and three more days in Lucknow but flew to Jaipur. Sources privy to the development however said that she will be back again amid Congress workers on Tuesday and the remaining three days programme will be as per schedule. Robert Vadra was summoned in connection with an alleged scam concerning 275 acres of land in the Kolayat sub-division of Bikaner district. According to sources, he will have to answer 55 questions as being drafted by the Directorate. Last week in Delhi, Vadra was subjected to intense interrogation by the ED in connection with a money laundering probe against him for his alleged role in procuring assets abroad in an illegal manner. The fresh summon by the ED comes after the Rajasthan High Court directed Vadra and his mother to cooperate with the ED, as Vadra did not report to the agency even after being sent three summons in the land scam case earlier. Vadra and his mother's statements shall be recorded under the Prevention of Money Laundering Act (PMLA). A criminal case was registered by the ED in connection with the Bikaner land deal made in 2015 after studying FIRs and charge-sheets filed by the Rajasthan Police on complaints made by the Bikaner tehsil office about alleged forgery in the land allotment. The ED, sources said, will question Vadra about Skylight Hospitality Pvt Ltd, a firm allegedly connected to him, which purchased the said land in the area.